I ordered the Achla CMP-05 Spinning Horizontal Composter from Amazon. Free 2-day shipping with a 30-day Amazon Prime trial and about $50 cheaper than I've seen in gardening stores ($153.99 at Amazon). I've been saving up for this since last summer. Hooray! No turning compost with a pitchfork! 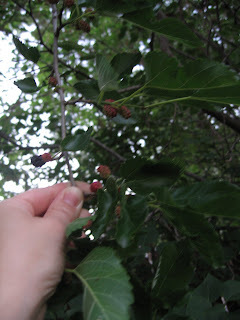 In other back yard news, I recently realized we may have a mulberry tree...or something similar. We've lived here for 6 years and it's the first year I've seen fruit on it. Sue at EcoStrides has pointed me to some good resources to help me determine what kind of tree this really is. If you have any thoughts, let me know! And more berry news...anybody know what these white spots on the raspberries are? Too much moisture? There are more of these spots this year than prior years. Yea for the new composter! I guess you know you're an adult when this kind of thing is exciting. I think the white spots might be from heat. My parents get them on some of their berries, but I don't think it's a problem, apart from being a little 'off'. Lovely composter! I think the spinning ones are a great idea. It looks like mulberry (morus) from what I can see on the internet. Did you try the berries yet? If you are still afraid to try them, maybe the Extension Service could help identify the tree. Let me know if you find any tips about composting. I have a similar, but home-made composter, and it is working way too slowly! I'll try the extension service next. I'm going to try a berry. I'm guessing 1 berry wouldn't hurt me. I'll have to sneak one so the kids don't mimic me.